Old Trafford, the "Theatre of Dreams". Manchester United are the best-supported football club in the world and this is your chance to be among the 75,000 crowd in a fantastic stadium. Share your passion with your comrades in arms as Zlatan Ibrahimovic and Wayne Rooney mesmerise their opponents. Take your place in the Stretford End and inspire the players to greater heights as the stadium becomes a cauldron of noise and passion. They do things with style at United and win with a swagger. Glory is never more than ninety minutes away and you’ll be part of a Premier League occasion every single time. Manchester is famed for its nightlife and a fantastic time is guaranteed. The city’s musical history from New Order to the Stone Roses, house music and now their contemporaries, is on every corner. You can’t help but love your time in the jewel in north west England’s crown. We have Man Utd tickets available in all parts of the ground so you won’t miss out on any Manchester United match. Thanks to our wide choice of Man Utd tickets, we cater for budgets. Whether you want to cheer on the Red Devils from the Stretford End or Sir Alex Ferguson Stand at Old Trafford or on the road, we can supply you with the Man United tickets for the match of your choice at unbeatable prices. Synonymous with the success which Sir Alex Ferguson brought to the club, the reigns of David Moyes and Louis Van Gaal saw them in decline. But the biggest club in the world is on the up. Jose Mourinho has them back in the race for the top four finish and the biggest names in world football want to play for the club again. Zlatan Ibrahimovic and Paul Pogba arrived in summer 2016 with United looking to sign more star names in summer 2017. You can be part of the resurrection with WOW Tickets your first-choice for reliable and guaranteed purchases. City where the match is being held. Manchester has a club scene unparalled in the UK, and with continued investment in the city centre, is becoming a tourist destination in its’ own right. Local Rivalries – when Manchester United is playing against Liverpool or Manchester City, there will always be a greater demand for tickets. When Arsenal are in town, tickets are hard to come by such has been the rivalry between the two clubs in the Premier League era. Manchester United don’t operate a match category system. 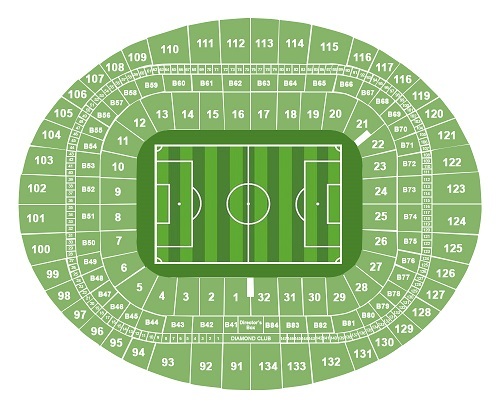 Tickets are priced based on which stand you are sitting in and which tier the seats are in. Although the club offer discounts for OAPs and young supporters, these may not be reflected in the pricing on the secondary market. There are four stands at Old Trafford. The long sides are called the Sir Alex Ferguson and South stands. This stand is the biggest in the stadium, and accommodates 26,000 fans across its’ three tiers. It was previously known as the North or United Road stand. Behind the seats, there is the Red Café, the Manchester United museum and the club’s trophy room. Opposite to the Sir Alex Ferguson stand is the second long side, the Sir Bobby Charlton stand. This is a single-tier stand, and hosts the club’s executive suites, as well as the dugouts and media centre. The first short side is the East Stand which houses the away fans among its 12,000 seats. It’s more commonly known as the Scoreboard End and is also home to the club’s disabled fans section. Saving the best until last, the second short side is the West Stand, usually known as the Stretford End. This is the main stand for home supporters. Previously, it was terracing but now all-seater, it is the place which generates the stadium’s atmosphere. 20,000 fans are seated in the two tiers. Watching Manchester United from any part of the ground is a magnificent experience. As you would expect, all seats are unobstructed and offer supporters an unparalleled view of the action. The upper tiers of the two long sides are typically filled with mature supporters, day trippers and as Roy Keane called them, “the prawn sandwich brigade”. You will however get a superb view of the match and take in the atmosphere generated by the other parts of the ground. As you might expect in a three-tier stand, you are a long way from the pitch in the upper tier of the Sir Alex Ferguson stand. Binoculars are advised but you will see the game from a unique perspective. The upper tier of the West Stand is frequently described as the ‘heart and soul of Manchester United’. Sitting in the upper tier of the Stretford End is a place to not only soak up the atmosphere but to also create it. If the upper tier of the West Stand is the ‘heart and soul’ of Old Trafford, the lower tier is its’ boisterous little brother. “Sing your hearts out for the lads” is an expectation in the lower tier; no excuses accepted, no quarter given. Joining in with the lower tier’s support for the team makes it the place to be. The two long sides see more of the action close-up, especially the South Stand where if you’re lucky enough, you’ll sit close enough to the home bench to hear Jose Mourinho barking instructions to his team, or reading his tactics on his assistant’s iPad. Find yourself near to the away bench? You’re expected to be Mourinho’s eyes and ears!!! Either way, you get a great view of the pitch as the benches see it, and are so close to the action that you can see the sweat spray in every tackle. If you find yourself in the North Stand lower tier, there are worse places to be than where it meets the East Stand. In days gone by, this was the old ‘K Stand’ at Old Trafford, a place where the passion and pride in the club rivalled anything that the Stretford End generated. It’s still got that unique atmosphere and ‘Old Skool’ mentality. It’s the place to find out what supporting United was like in the old days! 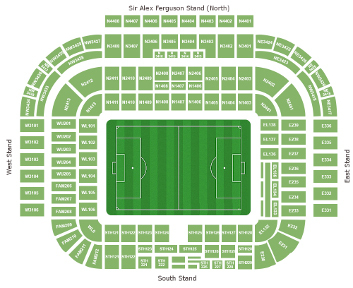 Old Trafford’s family section is in the lower tier of the West Stand, toward the corner where it meets the South Stand around the tunnel area. If you buy a junior ticket, it must be used by a child under 16. For 17 – 20-year-olds, there are young adult tickets but they must be used by a person in this age range. You can be challenged so take ID with you. There are just over 300 seats for disabled fans at Old Trafford, of which 120 are for the carers of wheelchair-bound supporters. 40 seats are available for blind or partially-sighted fans with 140 seats for ambulatory fans, as well as their friends and family. How to Buy Manchester United Tickets Online? Your best chances are in the secondary market. You have a variety of available categories. Pairs of tickets are also available (WoW guarantee them for all tiers), but for more than a pair or groups – contact us – we have it available in several tiers but not in all categories and not always. However, you should be able to find seats in the same block, reasonably close together. For the big matches, such as those against Manchester City and Liverpool, you are struggling but also for games such as Arsenal and Chelsea. Midweek matches see a lot of tickets available, but you need to be quick for the Europa League! These are popular matches no matter the opposition, and there’s a buzz about the place which is unique to them. Select your Manchester United fixture from our events table above or our match menu. You can buy for Manchester United home games or away tickets. In the review your order page you will be able to review Manchester United tickets that you have ordered and the total price you will be paying in the next stage if you have been given a coupon or discount code, enter this in the box and click “apply”. The final Manchester United ticket prices will be calculated and then click “Proceed to payment”. There are no hidden fees, or costs and the total price you see are what you will pay for Manchester United football tickets. After payment is successfully processed, you will be redirected back to our site, and you will receive a confirmation message. An email with your Manchester United ticket order details will be sent to the email address you have provided during your registration. Formed in 1878 as a works team for the Newton Heath Lancashire and Yorkshire Railway Carriage & Wagon Department – the Newton Heath LYR FC – and the rest, as they say is history. Who could have imagined that from such humble beginnings, a world-famous football club would grow? The club’s popularity soared during the Busby era. Sir Matt Busby, a club legend, managed the team between 1945 – 1969 and 1970 – 1971. His squad during the 1950s became affectionately known as “The Busby Babes”, winning the league in 1956 and 1957 with an average age of just 22 years old. In 1958, tragedy struck. Returning from a European Cup tie against Red Star Belgrade, a crash during take-off claimed the lives of 23 people, including 8 Manchester United players and 3 staff members. Their final game in English football remains a fitting tribute to their abilities: a 5 – 4 win at Arsenal. Sir Matt Busby survived, as did England’s 1966 World Cup hero, Sir Bobby Charlton, and in 1968, United became the first English club to win the European Champions Cup, beating Benfica 4 – 1 in the final. For Manchester United, it was a decisive moment. Seven cup wins in the next 25 years but it wasn’t until the Premier League’s first season that the Red Devils were next crowned champions. Twelve more titles followed in the next two decades, emphasizing how successful Man United are. In 1998 – 1999 season they were the first team to complete “The Treble” of winning the Premier League, Champions League and FA Cup. But United are more than trophies. Iconic players such as Best, Charlton, Robson and Cantona have worn the famous red shirt with the current crop including Pogba, Rooney and Ibrahimovic. The glory days aren’t far away from returning; was winning the FA Cup in 2015/16 the beginning of a new era? With Jose Mourinho in charge, the United faithful hope so. And he duly delivered. United were a difficult side to beat, going 23 games unbeaten during the season. That form delivered the League Cup (now the Carabao Cup) and the Europa League, when they outclassed Ajax in the final. With that win, the Red Devils became only the fifth club to win all three major European trophies. More importantly, Old Trafford once again stages Champions League matches. The glory nights are back! Bobby Charlton, 249 goals in 758 appearances Now Sir Bobby Charlton, he was until recently also England’s leading goalscorer before Wayne Rooney passed his record. A member of the Busby Babes, he survived the 1958 Munich Air disaster, becoming a vital member of the 1968 European Cup winning team. With his team-mates George Best and Denis Law, he formed the ‘Holy Trinity’. Such is his standing at the club, he was asked to join the Manchester United board of directors in 1984 and remains a director of the club. The South Stand at Old Trafford was renamed the Sir Bobby Charlton Stand in April 2016. Barcelona, 26th May 1999. With ninety minutes played, Manchester United’s bid to win the Champions League and so complete the treble, lay in tatters. They trailed Bayern Munich to Mario Basler’s 6th minute goal and were out of time. Or so everyone thought. Teddy Sheringham’s equaliser in the first minute of added time seemed to have put us on course for an additional thirty minutes of extra time. Straight from the restart, United forced a corner. Beckham swung it over, Sheringham headed goalwards and Ole Gunnar Solskjaer prodded the ball into the net. In the space of 90 seconds, United salvaged their season and became the first English club to win the Premier League, FA Cup and Champions League in the same season.